A mother on a mission can do amazing things, especially when working with an equally passionate parent support advocate. Nancy Mohrbacher, a La Leche League (LLL) leader in Chicago, Illinois, USA, said it was a mother in her group who gave birth to an idea that has become the Mothers’ Milk Bank of the Western Great Lakes—one of a number of milk banks sprouting up around the world to serve mothers who are unable to breastfeed exclusively but no longer want to settle for formula. The mother in Mohrbacher’s LLL group gave birth to a preterm boy, and the hospital staff insisted that he receive formula because he was too weak to exclusively nurse. The mother knew about the lifesaving and life-giving properties of breast milk, and she knew about the potential negative outcomes of feeding formula to a preterm baby. She told Mohrbacher that she would have preferred to feed her baby donor breast milk. This mother went on to ask Mohrbacher to help her start a milk bank for the Chicago and Wisconsin areas—a region with one of the highest infant mortality rates in the United States and for which a formal recommendation was made by the Wisconsin Neonatal Perinatal Quality Collaboration that low-birth-weight babies be fed pasteurized donor breast milk, rather than formula, when the mother’s own milk is not available. For those families who have healthy babies, but for some reason the mother was unable to breastfeed, milk banks can meet their needs as well, provided that critically ill and preterm infants have been helped first. The preterm baby in Mohrbacher’s group had a milder condition than other babies who are admitted to hospital neonatal intensive care units for care, and he is now nursing well despite formula supplementation. But for very preterm or more severely ill babies, anything other than human milk can cause serious health problems, like necrotizing enterocolitis (NEC), which occurs when a part of a baby’s intestines becomes inflamed and dies. The treatments for NEC account for 19% of all newborn health care costs. When NEC requires surgery, half of the babies treated die, and many of those who survive suffer from lifelong disabilities. Breast milk helps prevent NEC. According to a 2009 study (Quigley, M. et al. “Formula milk versus donor breast milk for feeding preterm or low birth weight infants”), small preterm babies fed infant formula are two-and-a-half times more likely to develop NEC than those fed pasteurized donor human milk. The components unique to human milk prevent the inflammation that causes NEC, among other complications. Even partial human milk feedings are much less likely to cause a baby to become seriously ill.
“Human milk is preventative medicine for these babies,” Mohrbacher said. With the advances in medical technology, more preterm infants are able to survive outside the womb. Since premature delivery and medical complications can reduce a mother’s milk supply despite her best efforts, more donor human milk is needed. Despite the life-saving properties of breast milk, the price per ounce for donor milk ranges from $3.50 to $4.50, and a prescription is required. Part of the expense stems from the pasteurization process, which is essential for preterm babies, as any pathogens in the milk could make an already sick or unstable infant more ill. In general, the cost of feeding a premature baby donor breast milk in the hospital is shifted to the hospital itself, government programs and insurance companies. After a critically ill baby leaves the hospital and a family can no longer afford pasteurized human milk, the charitable arm of a nonprofit milk bank will often reach out to supply these families with the milk that will protect their babies. Mohrbacher and her coworkers have assembled a team of experts to find a facility, buy equipment and begin processing donor milk for their region. They estimate that they will need approximately $1 million to open their processing facility and establish the charitable arm of the milk bank. Within three years of opening, they predict, the $4.50 per ounce that hospitals pay for human milk will allow their bank to become financially self-sustaining. As Mohrbacher and the Mothers’ Milk Bank prove, you do not have to be famous or rich or powerful to make a difference. Any caring individual, with proper help and funding, can establish a nonprofit milk bank. The Mothers’ Milk Bank are first and foremost a group of people who care about saving infants’ lives and are determined to help those infants survive and thrive. You can read more in the double “Voices of Breastfeeding” issue of Attached Family magazine, in which we take a look at the cultural explosion of breastfeeding advocacy as well as the challenges still to overcome in supporting new parents with infant feeding. The magazine is free to API members–and membership in API is free! 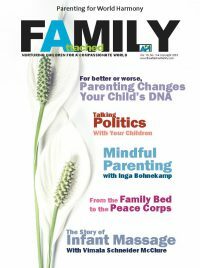 Visit www.attachmentparenting.org to access your free issue or join API.